Home >> Guides >> Buying Guides >> How To Find Out How Many Boxes of Laminate Flooring I Need? 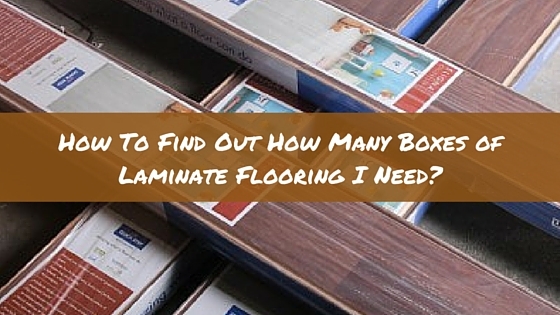 Are you asking yourself how to find out how many boxes of laminate flooring you need? Having difficulty calculating the square footage of your room? Not sure exactly how much flooring you’ll need? Don’t feel bad, we receive many calls from customers with these questions. Through step by instructions, the following article will answer all of your questions and make you look like a pro! Calculation of a standard square or rectangular room is simple and requires only to measure the length and width of the room and multiply the results. If you have a space with multiple rooms or your room is not perfectly rectangular, split your space into smaller rectangles and calculate the square footage separately for each area and add all of the measurements together. It’s a relatively simple formula! When it comes to laying laminate it always a safe bet to assume for extra. You will need to purchase extra flooring to cover any mistakes, accidents, and unforeseen damage. This is known as the waste factor. The general rule of thumb is to add 5%-10% to the final square footage you calculated in the first step. To calculate the number of boxes you need to know your final square footage, which is the total square footage + extra square footage for waste. Check packaging content of the floor you are interested in. All boxes of flooring have a different sq.ft. so this is important! Divide your final square footage of your room by the square footage listed on the box of the flooring. Round it up. Since laminate flooring is sold in full boxes only, you’ll have to round up your calculation to the closest full box. You will need 7 boxes for your installation. Simply use our online calculator, located within each product on our website. You will start with a basic setup, which is the square footage of one box. The calculator on our website makes this very simple! First you have to find the flooring that you want! Each floor will have different square footage, since the box content differs between manufacturers and brands. In our example, we calculated that we needed 157.5 sq.ft. to cover the rooms and 5% waste. Enter 157.5 into the provided box. 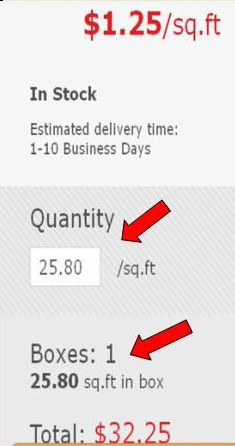 You’ll notice how the number automatically rounds up to the next sq.ft./box. 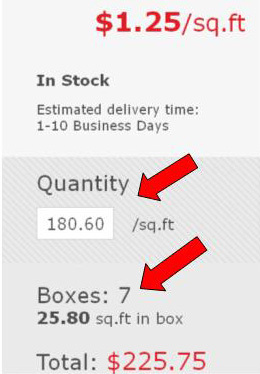 Since our calculation said we needed 6.6 boxes, the website automatically rounds up to the next full box. This would be 7 boxes or 180.60sq.ft. You will be getting a little extra than the waste you calculated for, but in the long run it could save you big bucks, especially if your flooring becomes discontinued! Including waste may require you to buy another box but it is worth it! You’re done! Continue with the checkout and you have ordered your floor! Congratulations! Planning a wood flooring project takes time and many measurements. Be sure to double check or even triple check your measurements. Especially when ordering an item that you cannot find locally, knowing the exact amount or ordering a little more will help prevent you from paying double shipping costs down the road. While you only pay a flat rate shipping fee for your larger order, you will need to pay a shipping and handling for smaller orders. Better to be prepared. If you’re still not sure then we encourage you to give us a call so we can help you decide on the correct amount needed. Simply call 1-800-520-0961 and we will be happy to help! Hi Anthoney, thanks for the question. First, you will want to find the square footage of your room. With 5% waste included, you are looking at 386.4 sqft for your project. The flooring you want to buy will have sqft listed per box. Once you know how many sqft the box includes, you will be able to determine the number of boxes needed! Best of luck with your project. Hi Mariette, with a 5% waste factor, you will need 253.89 sqft of flooring. The amount of boxes will depend on the flooring you want and how much sqft is in each box. Hope this helps! Hey Efrain, it would all depend on what particular floor as all brands are different! Hi Ricky, you would need 10 boxes with an added 5% waste factor. Hi Lynne, thanks for your question! The number of boxes will depend on which floor you are looking at. Each floor comes with different square footages per box, usually between 18 -24 sqft/bx. You are looking at 110 sqft, so you would need it to add up to that. Hi i have 118×194″ how many boxes wood planks i need 19.63sq.ft per box. Hi Maribeth, you are looking at 159.3 sqft, so you will need 9 boxes of flooring. This will include 5% extra for waste. Please let us know if you have any other questions! Hi Madge, you are looking at 144 sqft, so you would need 7 boxes, for a total of 164.24 sqft. This will include 5% for waste. I have a room thats 9×13 . Floor planks cover 45 sq ft per carton ..how many cartons would i need with some extra in case of waste.. ? ?? Hi Charles, thanks for your comment. Your room is 117 sq.ft (9 x 13). We recommend purchasing 5-10% extra to cover any waste or damage during installation, so we would advise purchasing enough flooring to cover 128 sq.ft. If each carton contains 45 sq.ft, we recommend you purchase 3 cartons of flooring. Please let us know if you have any other questions! Hi Gary, you will need 120 sqft without 5% in waste. Depending on the floor and the amount of sqft per box, your box count will vary. Hi Gabe – One plank would cover about 1.99 sqft. Hi Dee – We would need to know how many square feet are the box of flooring you intend to purchase before we can tell you how many boxes you need. Please reply to this comment with this information and we will be happy to help you! I have 6 boxes of laminate flooring. The boxes say 10 pieces(5-5/8 X Random lengths). 14.96 Sq ft per cartpn. How much will this cover? Hi Gia, thanks for your question. The 6 boxes will cover 89.76 sq.ft. total. If you need help calculating the square footage of your room, you click here for our room calculator. Hi Raven – You will need 15 boxes of flooring. Yes my living room measurements are 15’x13’ and box of flooring say that it will cover 23.91 sq.ft. And is $17.49 a box. I hate to say it but I’m to lazy to figure it with a calculator LOL thanks Todd!!! Hi Todd – You will only need 9 boxes of flooring. It will cost $157.41 for the 9 boxes, not including any taxes or shipping costs. Hope this helps! how many sq.ft will be covred with 140 ft ( 7 1/2 wide) wood. thanks. 140ft of 7.5in wide planks will cover 87.5 sqft. 20 planks of 7ft x 7.5in planks will cover 87.5 sqft. Thank you for this very informative blog. I certainly learned a lot especially with regards to calculating the number of boxes I would need to know my final square footage. I will definitely take note of this once I finally decide to have my flooring redesigned. Glad it was helpful Bobby! Hi Sandra – In order to calculate how many square feet your 14 boxes will cover, I will need to know how many square feet are in each box. This can usually be found on the side of the box of laminate flooring, or on the paper insert inside the box of flooring. Reply to this comment with the requested information and I will be happy to help you! Hi Judith! You will need 14 boxes of flooring. This amount has also taken into account 5-10% waste factor. Hi Derrick – In order to help you calculate how many boxes you will need, I will need to know how many sq.ft. are in the box of flooring you are considering. Each manufacturer and each collection of flooring usually has a different sq.ft. per box, which you can find on the box itself or on the website where the floor is being sold. Please comment with the sq.ft. per box and I will be happy to help you! Hi Kendria – I need to know how many square feet are in the boxes of flooring to be able to give you an answer. It should be listed on the size of the box or on the website as “Box Content”. The measurement should be in Sq.Ft. Please reply to this comment and I will be happy to help you figure it out! My room is 13×14, how many boxes do I need/? Hi Jope, thanks for the question. Your room is 182 sq.ft. The number of boxes will depend on the flooring you’re purchasing, as they all have different square footage per box. If you purchase on our site, we will automatically calculate that for you! Hello, my room is 12×14 and the laminate flooring is 13.74 sqft how many homeschool I need? Hi Kisha, thanks for the question. You will need 13 boxes of flooring, for 178.62 sq.ft. You room is 168 sq.ft. so you will have some extra planks for waste and cuts. Hi Shell – If I am reading your measurements correctly, you have 473 sq.ft to cover and the box of laminate has 23.68 sqft (2.2 sq. meters) in each box. You will need 20 boxes to cover the area plus 5% to 10% extra to cover any cutting mistakes or planks that could become damaged in the installation process. We would recommend you purchase 21 to 22 boxes to cover 473 sq.ft of the flooring you are purchasing. If you have any more questions or need additional help, feel free to reply to this comment, email us at support@bestlaminate.com, or use our Room Calculator! Hi Shelia, your room is 209sqft (19 x 11 = 209), you will need this much flooring, plus 5%-10% to calculate in waste factor, making the total you should order about 220sqft (209 x 0.05 = 10.45 [209 + 10.45 = 219.45]). Most boxes of flooring have anywhere from 13sqft to 25sqft of flooring, so I am not sure how the box of flooring you are looking at only has 1.37sqft inside of it. I would double check the box of flooring and then comment back on this post so we can help you further. Thanks for reaching out! Hi Candy! The amount of boxes will depend on which flooring you are looking at. Floors can have a range of sq.footage per box. If you are ordering on our website, your boxes will automatically populate when you enter your square footage. Hi Josh! Assuming you mean your bathroom is 10 ft by 10 ft, your square footage for the room is 100 sq ft. You should then calculate an additional 5% to 10% for the waste factor (such as incorrect cuts or damaged planks), so the total flooring you will need will be 105 sq ft to 110 sq ft. I cannot tell you how many boxes you will need without knowing which flooring you plan on purchasing, because the sqft per box varies depending on the style of the flooring and the manufacturer of the flooring. If you are able to give me the sq ft per box I would be happy to help you! I have 170ft of oak snap together flooring and apox 210sqf of space to cover. Can someone please tell me if I have enough flooring or will I need a little more, I am covering a pretty square area and I just need a simple answer please. Hi Jodie – 170ft of flooring is not enough to cover 210sqft of space. If you have any other questions or need more flooring, please feel free to call us at 1-800-520-0961 and we will be happy to help you finish your flooring project! Hi Eddie! Thanks for your question. The number of boards in a box will depend on the brand and manufacturer. Generally, there are 6-9 planks in a box, making 18 – 25 sq.ft. on average. This information will be listed on product specifications. Hope this helps! Where is the link to this calculator that figures out how many boxes of flooring one needs. Am I blind? Hi Michelle! You can convert sq. feet to boxes through the calculator our website. Select any product and type in the square feet in the right hand calculator at http://www.bestlaminate.com. Since products have different sq. feet per box, this helps determine your need per product. Hope that helps! How many boxes of hardwood flooring do i need for 16’x16′? Assuming your room is a square 16’x16′, you will simply multiply the length of the room by the width of the room, giving you 256 sq.ft. of floor to cover. Add 10% for the waste factor, so you would end up with needing 281.6 sq.ft. total. If you room is not a perfect square, please visit this blog post to see the best way to calculate your square footage. In order to find how many boxes you need, you will first need to look at the sq.ft. on the box of flooring. You will then divide 281.6 by the sq.ft. shown on the box. This will give you how many boxes you will need to cover your room. You may have to round up so you are purchasing a full box, as only full boxes of flooring are sold. Each box of flooring contains a different sq.ft. decided upon by the manufacturer, so there is no standard. I don’t know which hardwood flooring you’re looking at, so I can’t give you a definite answer. I hope this has helped you! If you have any more questions, please call our sales representatives and they can help you further! 1-800-520-0961. I recently had to calculate the flooring in a living room that had some weird angles and a hallway. I used the calculation here for the living room to figure out how much product I need but I also used a floor app that I just downloaded to my phone for another angle room. I tried a few different apps that you take a picture of the room and it calculates all the corners and the hallway. Also I recently got a guillotine type of shear and worked great for working indoors during December 🙂 No dust so it worked out great.